So Luke what got you into footy? My brother Paul played for the Nottingham Leopards Ice Hockey team and they formed the Nottingham Scorpions Australian Football team during their summer recess. Paul got me into footy 2 seasons ago. Tragically his sporting career has been curtailed by a car accident, but his encouragement has been great motivation for me to keep going with it. I come from a soccer background, which I’ve played for 15 years as a goalkeeper-hence kicking and catching came pretty naturally. I played rugby at a fairly high level, but that was only during my school years and I enjoyed much more success with the round ball. I have played for many district teams over the years from which many of my former team mates are currently playing in the English Premiership. Former team-mates in the EPL? Yes. The highest ranked soccer team I played for was the Midlands Representitive Team when I was 17. I played for years with Jermaine Jenas, formerly of Nottingham Forest and Newcastle United and now playing for Tottenham Hotspur. So how have you found Aussie Rules football? In my eyes footy is a much more exciting sport and I love the contact. But I guess the main reason I've chosen footy for my sport is the level of honour. I mean there isn't the whole aspect of play-acting and trying to influence the umpires decision by constant moaning, I like that this is quickly penalised. Nottingham Scorpions coach, Charlie Kielty saw my enthusiasm and helped me massively throughout my first season, rewarding me with the captaincy for the second season. Early 2005 there was talk about me making the British side to play in the International Cup in Melbourne in August. So I decided to really focus on this for the year working in a gym and training constantly. Matt Connell (former Eagles/Crows midfielder) coached the British team and was very easy to learn from, his passion for the game still obvious to all. He and the rest of the coaching staff became a big influence in my learning curve. How did you go at the International Cup? I had always played as full back for Nottingham, but a big part of our game plan was always me breaking through lines from the back. During the international Cup, I began as full back but coach Matty Connell soon switched my role to full forward (finally a chance for a bit of glory!!!) and I ended up being top scorer for the team. Unfortunately after a dubious decision in the penultimate game I was reported and missed the final qualification game. This was without doubt the lowest point of my sporting career. And you've stayed on, training with Port Melbourne. About a month before the tournament I was given the vice-captaincy for the British Bulldogs team, and saw this as a great addition to put on my sporting CV. It made me think why not really give it a go, I decided to not waste any opportunity but to spend a year in Australia on a working visa and try to play at the highest standard possible. So after the tournament I e-mailed a few VFL teams and Port Melbourne Manager Barry Kidd and Head Coach Saadi Graz showed the most interest offering me a three week trial. The staff at Port have been fantastic and my trial period has been extended up to the Christmas period. So I'm now in my fifth week of full training and loving every minute. I understand that chances like this don't come along very often (especially for an Englishman) and the coaches have supported me all the way, never refusing when I ask for extra practice, or advice on anything. The players have also accepted me with some fantastic Pommie-Aussie banter coming out of it all. What do you think about the future for Footy in Britain? The sky is the limit for Aussie Rules in the UK. Increased sponsorship and promotion would surely take advantage of a huge possible market, in that more people would play, more people would watch and more money could be generated through the game. There is currently talk about another Aussie Rules organisation starting up in England, and in my eyes, this can only be a good thing, the more accessible the game is...the better. The BARFL are great and have been so supportive of me. This is an exciting time for me, especially with my role in the British team, (and I have every intention of becoming the next full Captain) I see this as a real opportunity for me to drive this game within Britain, taking full advantage of my experiences in Australia, with the possibility of gaining recognition as one of the first English pioneers of the game. I gather your Nottingham team-mates have nominated you for a Sports Award. Yes, they've nominated me for the Midlands Amateur Sportsman of the Year Award back in England. It's drawn sometime in January. The nomination is purely for my Aussie Rules career - brief that it is so far! Well great talking with you Luke and good luck with the Midlands award and more importantly - with making the final list for Port Melbourne! Thanks Peter, I'm giving it my best shot. I'd be very excited of the chance to pull on the red and blue. Thanks for putting my story on WFN, cheers! 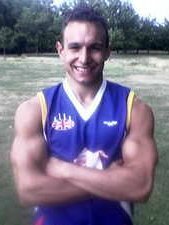 Known as 'Crusher' to his Nottingham Scorpions and the British Bulldogs (GB) Australian Rules Football team-mates, Luke has been passionate about playing many sports throughout his life. He has captained many school football and rugby teams to much success and has been in much demand by other local teams and at University. He is a keen golfer and was identified as having excellent swimming potential at a young age. Luke became involved with Aussie Rules 2 seasons ago whilst completing his finals at Manchester University. His younger brother Paul played ice hockey for the Nottingham Leopards, and his team took up Aussie Rules to maintain fitness during the closed season under Coach Charlie Kielty. Paul introduced Luke to the game before serious injuries in a road accident curtailed his own activities. Last season Luke captained the Nottingham Scorpions to win the League Championship and was elected Vice Captain for the British Bulldogs, dedicating his success to Paul. Last July the GB team went on tour to Australia for the World Championships, drawing against experienced favourites such as New Zealand, Samoa and Papua New Guinea. Expected to attain 9th position in the world, GB outplayed themselves to reach No 6 and aim to improve further for the next World Cup in 3 years. Luke has since not returned to Nottingham, instead is taking advantage of opportunities down under. He is currently undergoing gruelling trials with Port Melbourne Aussie Rules team (the equivalent of our 1st Division football league) whilst working in a local gym. To date he has survived several 'cuts' and is battling to improve his skills against seasoned professionals. The coach has confirmed he will honour Luke's GB commitments - his proudest moments have been to represent his country and parade the Union Jack around the stadium at the opening of the World Cup, whilst getting the crowd to sing Rule Britannia! Socially, Luke is a minor celebrity, signing autographs and opening school fetes, whilst taking every opportunity to promote Nottingham around Melbourne. He is an excellent communicator, and has a huge personality matched only by the size of his biceps, as anyone who knows him will testify! He has no idea that he is being nominated for this honour, but we feel that his 100% commitment to his team-mates, his team, his City and his Country deserves to be acknowledged, and would certainly help to alleviate the home-sickness which occasionally strikes!